If you have been perusing this website, it should certainly come as no surprise to you that centenarians hardly achieved their long-life by being sedentary. To a tea all centenarians report not only being active throughout most of their lives, they have maintained some level of activity even to this day. A Parisian physician who lived to be 103, A. Gueniot, said that at the age of 99 he strode up three sets of stairs every day on the way up to his study to work on a book he was writing! A 95-year-old English doctor walked one to three hours every day and took vacations that included hiking and mountain climbing. The celebrated world's oldest person, Ma Pampo while never having an exercise regimen per see worked at hard physical labor most of her life. How much should we exercise and what exercises should we do to enjoy the longevity of the centenarians? Experts all agree that even the smallest amount of routine physical activity everyday can make a big difference. In his book Ageless Body Timeless Mind, Dr. Deepak Chopra said by performing consistent, low-level activity, even as little as walking half an hour a day, you can gain much of the longevity benefits conferred by rigorous exercise. Other fitness experts recommend specific exercises to help you reach your 100th birthday, and stay in shape once you get there. Strength and Resistance Training - as we age resistance training becomes more important for increasing strength and building lean muscle. Lean muscle tissue burns fat more efficiently, raises metabolism, and can reduce your risk of heart disease and osteoporosis 20 -45 ,mute of resistance exercise is recommended at least 3-days a week. Aerobic Exercise - Walking, Jogging, Swimming for 30-40 minuets a day 3- 4 day a week. Five-minutes of warming up by walking, or riding a stationary bike riding, or using a stair-stepperFollowed by at least one, or at best two, sets of 10 wall push-ups. If this seems like too much there are many exercises or physical activities that can be done at any age. Tai Chi, for example, the ancient Chinese program of meditative movements is practices by many centenarians. Like yoga or dance it has moderate aerobic effects, uses all muscle groups, and improves flexibility. All centenarians have come to understand that staying physically active not only keeps them physically strong, but also can help them stay mentally alert. The New England Centenarian Project discovered that active lifestyles contributed not only to the centenarians' in the study overall health but to their agile minds. It has long been known that exercise also has the effect of decreasing emotional stress and anxiety, and this is certainly no exception among centenarians. And group exercises such as Yoga, Tai-Chi, dance, or even just taking an evening walk with a friend are a way to maintain social connections for many centenarians. Is there a "Centenarian Gene"? Life Expectancy Tests: How Accurate Are They? 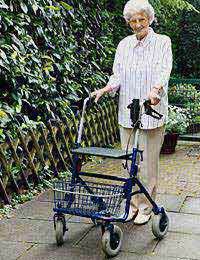 I live in New York City, and have nearby neighbors who are centenarians. My age is 84, please email any information on centenarians.